One of the easiest and most affordable ways to increase your living space might be right under your feet! Every year, we work with homeowners across the St. Louis area to carve out more square footage with no need for additional acreage. Basement finishing offers the perfect opportunity to think big and incorporate fun features not typically found on the main floor. However, we’ve been in the business long enough to know that a basement renovation requires an extra degree of planning and preparation if you want the process to run smoothly. This sounds like a no-brainer but it can be harder to determine than you might think. Before you go to the expense of a basement renovation, have a professional inspection to determine whether the foundation is properly sealed. We’ve seen more than a few grand plans for finishing a basement squelched by local building codes. Do you have enough clearance for ceiling height? Is the electrical work up to code? Have you obtained proper building permits? All questions that need answers before anyone lifts a finger. Most building codes require a fair bit of clearance space around the furnace, water heater and laundry machines. Make sure your plans account for an unfinished area large enough to accommodate these appliances. If your basement finishing plans include bedrooms, think about taking extra measures to soundproof the ceiling. If the deafening sound of upstairs footsteps makes it impossible to sleep downstairs, your new bedrooms won’t be as useful as you planned. 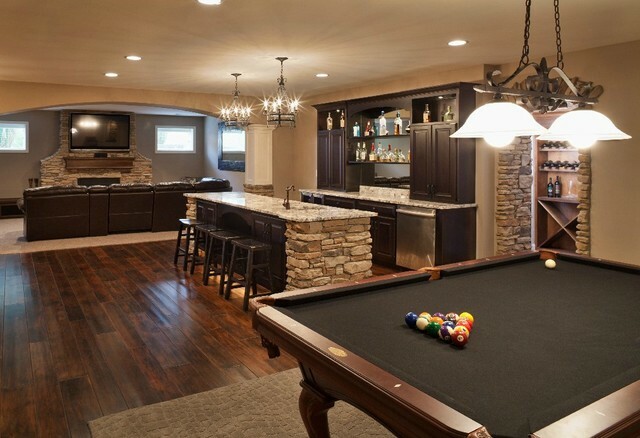 Gaming tables are a fairly common part of many basement finishing plans. As you’re designing the layout, be sure you’ve included enough clearance space around pool tables and such to allow enough room to use them comfortably. These are just a few examples of some of the things you need to consider before you begin a full-scale basement renovation. Call us today to talk through your plans and learn more about how the professionals at Terbrock Remodeling & Construction can help you turn your dream basement into reality!